Locate the in the upper right hand corner of the Internet Explorer browser window. Select the add-on, and click the Disable button. Locate the Pop-up Blocker section. Ensure there is a check mark present. Thank you for your reply. I will perform the suggested tasks this evening. I did notice that there is a ScorpionSaver program that is present in my program list in Control Panel. It indicates that the program was created on 11/13/13. I know that I had tried to delete this program out of the program list prior to posting on the WhatthTech site. It appears to be back again however. Should this be a concern or should we try to delete again? Yes, remove it from the programs list prior to running the other steps outlined. I also checked in the IE Manage Add On's. Neither the GetSavin or ScorpionSaver programs are listed there. The pop-up blocker option is checked. DNS Suffix Search List. . . . . . : hsd1.ga.comcast.net. Connection-specific DNS Suffix . : hsd1.ga.comcast.net. Description: The file system structure on the disk is corrupt and unusable. Please run the chkdsk utility on the volume Windows. Description: A timeout was reached (30000 milliseconds) while waiting for the Windows Presentation Foundation Font Cache 3.0.0.0 service to connect. You must run the command prompt as an administrator or in an "elevated mode". Start menu, in the search bar type "cmd"
Right-click the cmd icon, select "run as administrator"
If you have user account control (UAC) set up it may prompt you to accept that action. The disk must be locked. If chkdsk cannot lock the drive, a message appears that asks you if you want to check the drive the next time you restart the computer, select Yes, and reboot. Open the Start Menu, and type eventvwr.msc in the search box and press enter. If prompted by UAC, then click on Yes (Windows 7) or Continue (Vista). In the left pane of Event Viewer, double click on Windows Logs to expand it, then right click on Application and click on Find. Copy and paste Chkdsk into the line, and click on Find Next. You will now see the system log for the scan results of Check Disk (chkdsk). Post in your next reply. 1) ScorpionSaver program has been removed from Program list - should we still be concerned with key "wow.6432node" that would not delete? 2) ScorpionSaver Ad pop-up and GetSavin Ad pop-ups do not seem to be effecting IE at present. IE Browser seems to be running fine. 3) about:blank appears in IE URL section when a new tab is opened in IE. I've read reports of this being related to a virus. Is that accurate information. 347 large file records processed. Cleaning up 461 unused index entries from index $SII of file 0x9. Cleaning up 461 unused index entries from index $SDH of file 0x9. Cleaning up 461 unused security descriptors. 243889151 KB total disk space. 97298328 KB in 134555 files. 77208 KB in 24289 indexes. 277307 KB in use by the system. 146236308 KB available on disk. 60972287 total allocation units on disk. 36559077 allocation units available on disk. Thank you, the log is the correct one. 1. That is a registry key, we do not want to remove a key. Was there any additional information when you received that notice? 3.It can be, but not in every case. Try this to address the about:blank issue. Open Internet Explorer >Tools >Internet Option >General. 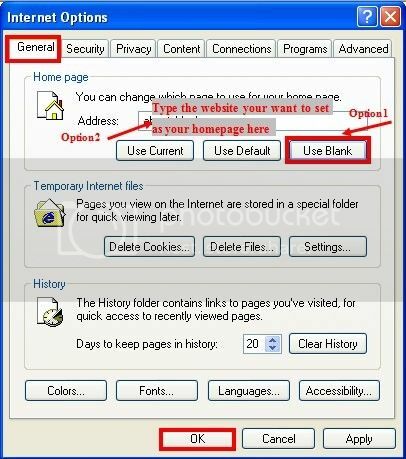 One is to set homepage as a blank page. Then click OK to save the change. Good morning. Thank you for your reply and assistance. 2) I followed you instructions to re-set the about: blank to my home page when opening a new tab. It seems to be functioning properly. 3) No more Ad pop-ups at present however I did see the following file in my "C:\temp\ScorpionSaver.msi" folder. Should I be concerned or should this be removed? Let's see if there is an entry still listed in the Registry. It's very important that you do not make any changes in the Registry until I give instructions to do so. In the left hand menu under Programs locate regedit, right click on it and select "Run as Administrator"
If a UAC windows opens select Yes. Left click on each one until you locate the one for ScorpionSaver. Then left click and choose Copy Key Name, paste the entire key name in your next reply. In the Search programs and files box, enter Disk Cleanup and press Enter. Locate Disk Cleanup in the list and double-click to open. Wait for the window to open. Note: Setup Log Files and System error memory dump files should be left un-checked. Click OK. Click Delete Files. The window will close when done. Hello OCD - I was unable to locate the file in the Registry location that you had listed. I went ahead and ran a search of my registry using the word "scorpionsaver" There were multiple entries that were returned. I have copied each key for your review. I have not deleted anything from the registry. ScorpionSaver file remains in the "C:\temp\ScorpionSaver.msi"
According to the last MBAM log this was removed so let's run it again and see what the report shows. Locate Malwarebytes' Anti-Malware (it should be on your desktop). Right click and select "Run as Administrator" mbam-setup.exe and follow the prompts to run the program..
Once the program has loaded, select the Update tab to get the latest updates before performing the scan. Select Perform quick scan, then click Scan. Do Not Delete anything this time around. Vista, Windows 7 & 8 Right click and select "Run as Administrator"
Good evening. I have run the Malwarebytes program and posted the log below. I also ran the TFC prgram as suggested. I couldn't find a log for this scan. I did check the C:\temp\ folder and the ScorpionSaver.msi file is still present. C:\temp\ScorpionSaver.msi (Adware.Adpeak) -> No action taken. Go ahead and re-run MBAM, this time select to remove items found, then reboot and check for the ScorpionSaver file in the temp folder.